The North Atlantic Treaty Organization (NATO /ˈneɪtoʊ/; French: Organisation du Traité de l'Atlantique Nord; OTAN), also called the North Atlantic Alliance, is an intergovernmental military alliance based on the North Atlantic Treaty which was signed on 4 April 1949. The organization constitutes a system of collective defence whereby its member states agree to mutual defence in response to an attack by any external party. Three NATO members (the United States, France and the United Kingdom) are permanent members of the United Nations Security Council with the power to veto and are officially nuclear-weapon states. NATO's headquarters are located in Haren, Brussels, Belgium, while the headquarters of Allied Command Operations is near Mons. NATO is an Alliance that consists of 28 independent member countries across North America and Europe, the newest of which, Albania and Croatia, joined in April 2009. An additional 22 countries participate in NATO's Partnership for Peace program, with 15 other countries involved in institutionalized dialogue programmes. The combined military spending of all NATO members constitutes over 70% of the global total. Members' defence spending is supposed to amount to 2% of GDP. France announced their return to full participation at the 2009 Strasbourg–Kehl summit. The first post-Cold War expansion of NATO came with German reunification on 3 October 1990, when the former East Germany became part of the Federal Republic of Germany and the alliance. This had been agreed in the Two Plus Four Treaty earlier in the year. To secure Soviet approval of a united Germany remaining in NATO, it was agreed that foreign troops and nuclear weapons would not be stationed in the east, and there are diverging views on whether negotiators gave commitments regarding further NATO expansion east. Jack Matlock, American ambassador to the Soviet Union during its final years, said that the West gave a "clear commitment" not to expand, and declassified documents indicate that Soviet negotiators were given the impression that NATO membership was off the table for countries such as Czechoslovakia, Hungary, or Poland. Hans-Dietrich Genscher, the West German foreign minister at that time, said in a conversation with Eduard Shevardnadze that "[f]or us, however, one thing is certain: NATO will not expand to the east." In 1996, Gorbachev wrote in his Memoirs, that "during the negotiations on the unification of Germany they gave assurances that NATO would not extend its zone of operation to the east," and repeated this view in an interview in 2008. According to Robert Zoellick, a State Department official involved in the Two Plus Four negotiating process, this appears to be a misperception, and no formal commitment regarding enlargement was made. Between 1994 and 1997, wider forums for regional cooperation between NATO and its neighbors were set up, like the Partnership for Peace, the Mediterranean Dialogue initiative and the Euro-Atlantic Partnership Council. In 1998, the NATO-Russia Permanent Joint Council was established. On 8 July 1997, three former communist countries, Hungary, the Czech Republic, and Poland, were invited to join NATO, which each did in 1999. Membership went on expanding with the accession of seven more Central and Eastern European countries to NATO: Estonia, Latvia, Lithuania, Slovenia, Slovakia, Bulgaria, and Romania. They were first invited to start talks of membership during the 2002 Prague summit, and joined NATO on 29 March 2004, shortly before the 2004 Istanbul summit. In Istanbul, NATO launched the Istanbul Cooperation Initiative with four Persian Gulf nations. At that time the decision was criticised in the US by many military, political and academic leaders as a "a policy error of historic proportions." According to George F. Kennan, an American diplomat and an advocate of the containment policy, this decision "may be expected to have an adverse effect on the development of Russian democracy; to restore the atmosphere of the cold war to East-West relations, to impel Russian foreign policy in directions decidedly not to our liking." 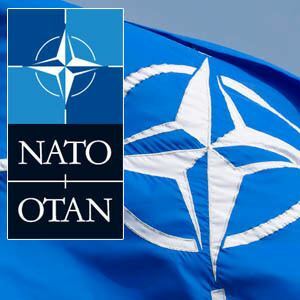 At the 2014 Wales summit, the leaders of NATO's member states reaffirmed their pledge to spend the equivalent of at least 2% of their gross domestic products on defense. In 2015, five of its 28 members met that goal. The European Union (EU) signed a comprehensive package of arrangements with NATO under the Berlin Plus agreement on 16 December 2002. With this agreement the EU was given the possibility to use NATO assets in case it wanted to act independently in an international crisis, on the condition that NATO itself did not want to act—the so-called "right of first refusal". For example, Article 42(7)of the 1982 Lisbon treaty specifies that "If a Member State is the victim of armed aggression on its territory, the other Member States shall have towards it an obligation of aid and assistance by all the means in their power". The treaty applies globally to specified territories whereas NATO is restricted under its article 6 to operations north of the Tropic of Cancer. It provides a "double framework" for the EU countries that are also linked with the PfP programme. During August 2016 it was announced that 650 soldiers of the British Army would be deployed on an enduring basis in Eastern Europe, mainly in Estonia with some also being deployed to Poland. This British deployment forms part of a four-battle group (four-battalion) deployment by various allies, NATO Enhanced Forward Presence, one each spread from Poland (the Poland-deployed battle group mostly led by the U.S.) to Estonia.